For nine years, Jane Fawkener lived with her father in the Middle East, knowing more about his covert activities for the British government than anyone realized. When her father disappears and officials seem content to presume him dead, Jane returns to England. She expects that her father will have left her a message with his trusted bankers. Instead, she is a given a book, The Husband Hunter’s Guide to London and £200 on which to survive until she finds a husband. Jane refuses to believe that her father is dead or that she should accept the book as merely directions for finding a husband. Government officials are not quite as indifferent as Jane thinks they are. Edmund Dalby, Viscount Hazelwood, a member of a select group of gentlemen spies, is pulled from his usual assignment of gathering information the Foreign Office might find useful at assorted brothels and gaming hells to keep a watch on Jane. His mission ostensibly is to serve as protocol officer for Jane’s acceptance of a posthumous award the British government is presenting to her father, but his real purpose is to keep Jane and any papers she may have pertaining to her father’s work from falling into Russian hands. At first, Jane plans to evade Hazelwood, but that proves difficult. It soon becomes clear that Jane is in danger. Even then, she and Hazelwood must learn to trust each other before they can work together to find the answers they are both seeking. There are obstacles along the way and threats to both of them, but of course, they find those answers--and a husband for Jane in the process. 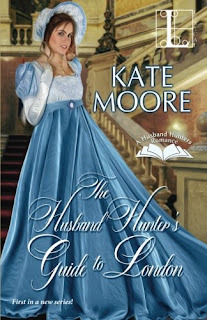 I was elated when I learned that Kate Moore had a new historical. Although The Husband Hunter’s Guide to London did not replace Moore’s Sons of Sin trilogy as my favorites of her books, I thoroughly enjoyed this story which offered the wit, intelligence, and “something different” that made me a Kate Moore fan years ago. Jane is definitely not the typical historical heroine in experience or in personality. English society is foreign to her, and Moore makes us aware of this in ways large and small. Hazelwood, a disinherited rake reclaimed by a spymaster, is less unusual but no less appealing. I thought his surprised pleasure in his reform was a nice touch. I found both lead characters interesting and engaging. The historical context of the novel added to its appeal. I knew little about “The Great Game” and Russo-British relations in the nineteenth century, and I found the subtext in that area so fascinating that I did more reading, nonfiction this time, on the subject. I also loved that Moore takes her reader beyond the ballrooms and great houses to parts of London that are often disregarded. Moore skillfully balances the suspense and romance. The sizzle thermometer remains in the mild range in this book, so if a high sensuality level is a requirement for you, you may want to pass on this one. However, if you like historical romance that targets a reader’s mind as artfully as it targets her heart, I suggest you add this book to your TBR tower. Moore continues the Husband Hunters with A Lady's Guide to Passion and Property, a July 3, 2018 release. I have already added it to my list of must-reads for the new year. OK - another new to me author. And another book that sounds like one I would truly enjoy. I appreciate the review and the fact that I have found another author and tons of more books I really need. Kate Moore is a terrific writer, Annette. I hope you enjoy the book. Thank you for the review. I've not read anything by Kate, so I've put this book on my "wish list". This one sounds delightful and a perfect read for me. It is on my Wish List to get, hopefully sooner rather than later. She is a new author to me and I do like the sound of this book. Thanks for the review Janga. I'll be looking for this book. I think I would enjoy this one - thanks. She's a new to me author but this book sounds like something I'd read. Thanks!